It’s time for a new review of a top survey software provider. Today we will take a look at the free account that Zoomerang offers. 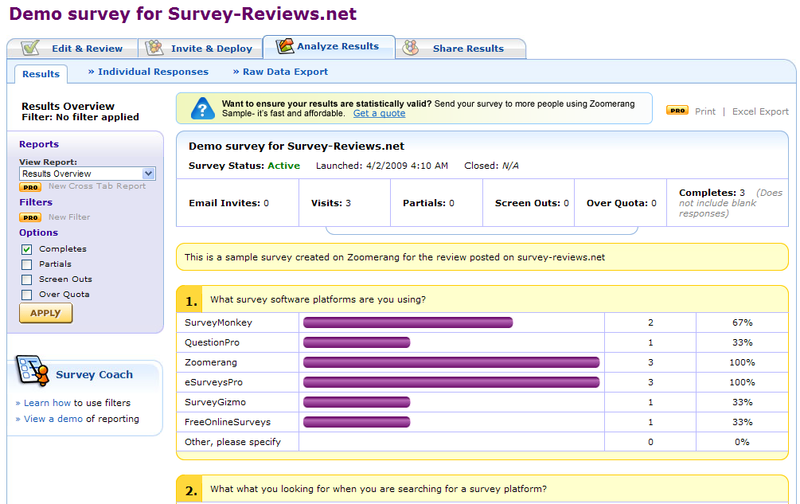 Zoomerang is one of the best known survey software providers, online since 1999 according to their site. 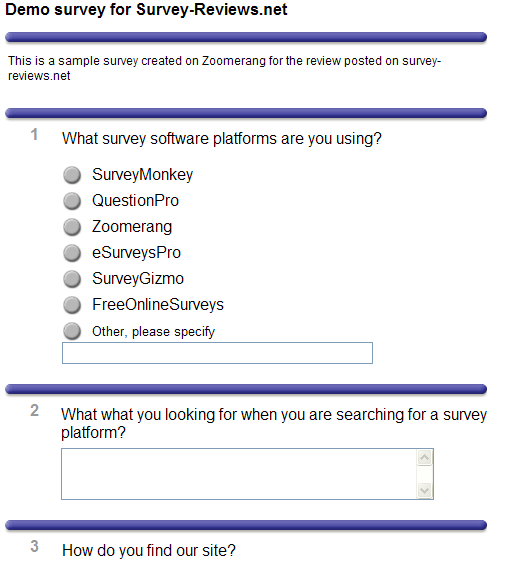 Very much like SurveyMonkey and QuestionPro that we have previously reviewed, Zoomerang offers survey software as a service (SaaS) for businesses conducting consumer, competitor, and customer satisfaction surveys. 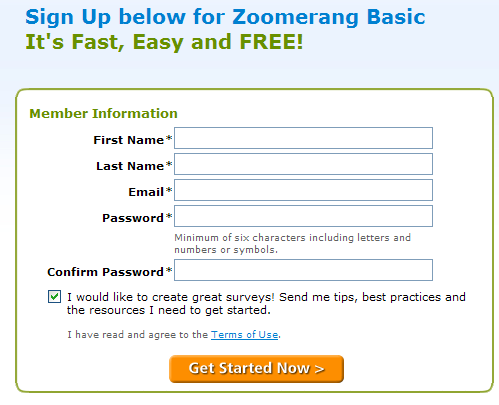 Signing up on www.zoomerang.com only takes a minute. And … surprise: a 4th option – import a SurveyMonkey survey. They give you instructions on how to export your data from SurveyMonkey and upload it here. I have to be honest and tell you that I was kind of amazed when I saw this. Is this even fair? What if all Zoomerang competitors will offer this kind of feature (“Import a Zoomerang survey”)? I wonder if they would like it. Anyway, we will try to create a survey from scratch. 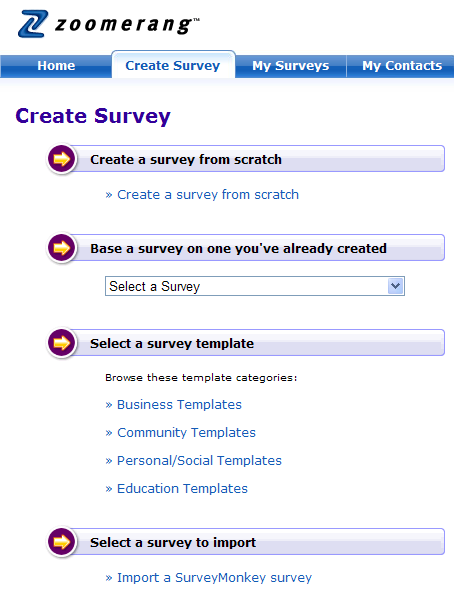 After entering a name for the survey, the survey editor appears. Here you can select one of the 17 themes available, edit survey title and properties, add/edit/delete questions. We will start adding some questions to our survey. 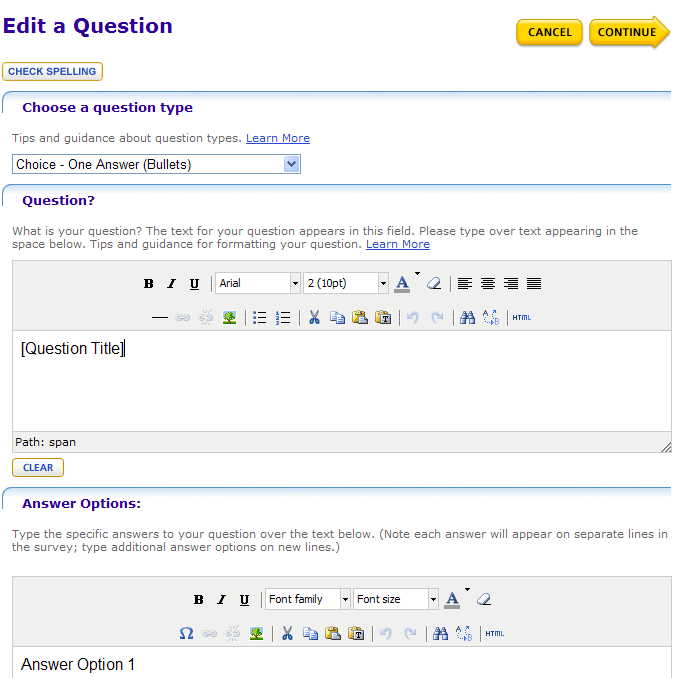 The question editor has rich text editors for question text and answers. A spelling checker is also included. I am happy that it does not show up in a popup like SurveyMonkey and QuestionPro do. You can choose to randomize the answers for free, but you can make the question mandatory only if you have a paid account. We have added more questions to our survey. Here is how it looks in the preview page. What I like in the survey editor is the possibility to move each question up and down with just one click. It’s probably more difficult to move it on long distances, but to switch the order of 2 questions, it’s perfect. One thing I don’t understand how to do is copy/paste questions. There are some links next to each question, but they are disabled. After adding all the questions, now I would like to deploy the survey. But it’s doesn’t seem to be that easy. I need to move to another page to enter a “greeting message”. It seems that before going to the actual survey, the users will see another page with this message. Why? Can I get rid of this page? 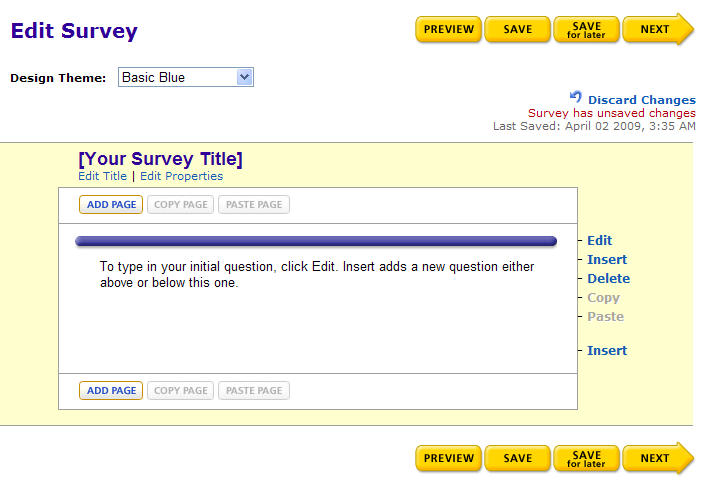 Integrate with an online survey panel and have people answering your survey. (I wish I would have been able to write the link here, but clicking on the “Submit” button just shows me yet another page when I can customize to allow a single respondent or multiple respondents per computer. Then another page with the sharing options available just for paid accounts. Then a review page with all options I have selected. I finally click on the “Launch survey” button). 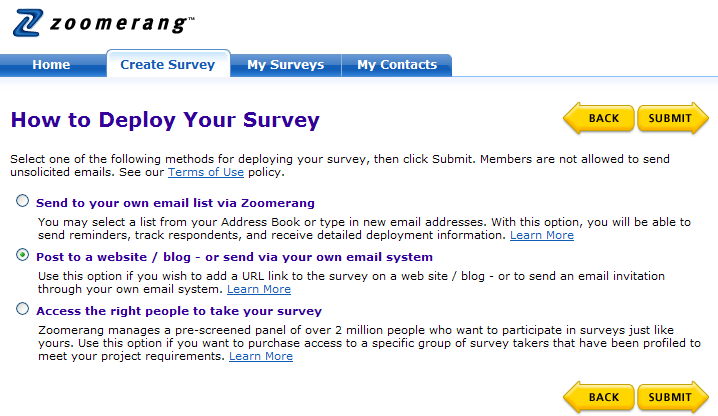 A nice thing is that, even if I have a free account, on the survey page no Zoomerang branding appears. But, they have that welcome screen and the final page to cover it. I have entered a few responses into our survey. It’s time to take a look at the reporting section now. Reporting section is exactly what I was looking for: it’s nice and clean. It’s very similar with what SurveyMonkey offers. Taking another look at this reporting section, I realize that it’s very easy to navigate in it and in other sections related to the survey. There are tabs that can easily send you to “edit & review” the survey, “invite & deploy”, “analyze results” and “share results” (this is not available for free accounts). This type of navigation is very nice and it’s much better than the interminable wizard I had to go through when I first created the survey. Tip to Zoomerang: get rid of that long wizard. Set some default options. The user will customize them after that if it’s needed. Import SurveyMonkey surveys. I don’t think this is a fair option. It’s one thing to offer instructions to your users if they ask about it, it’s another thing to have it like full featured on your site. Although I do see your point, as a former SurveyMonkey user I appreciated the ability to bring my existing surveys over to Zoomerang – it saved me a great deal of time and effort so it made the transition process much easier. However, without their notification of the feature I would not have been aware of it nor would I have thought to have asked about it. I agree that for the users is a great feature, but I am asking if it’s a fair competition between Zoomerang and SurveyMonkey. First of all I think it’s a recognition of the SurveyMonkey power on the market and secondly I think it’s a direct attack. It would be great if you would compare these surveys by liting the number of questions you can ask, number of types of questions, fees, number of responses allowed, …. on a chart. 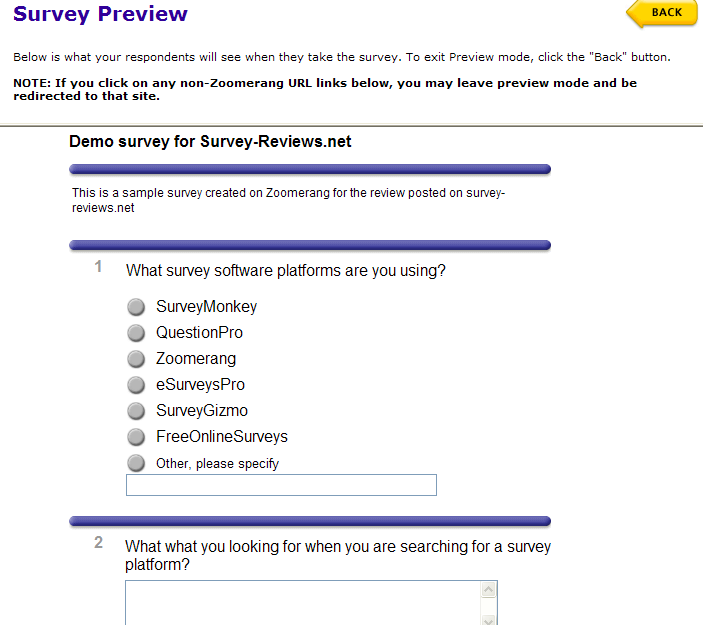 I learned that SurveyMonkey will only allow 10 questions, but how about QuestionPro and Zoomerang? The easiest and fastest way for people to start making money are paid online surveys.The good thing is that you don’t need any skills.You can start work now and to make your first $30 in several hours.The main problem is that most of these survey sites are scams.I spend more than 3 months to find legitimate survey site.And I found only one that is legitimate and absolutely free to join.So if you are serious about making money at home, just follow this link and create a simple registration. I do not agree with you about the fact that bringing the user’s content to another provider is not fair, after all the content is not a SM copyright, they only offered the shell to keep it and were paid for it. As long as the customer decides to keep the content somewhere else, it is their fault that they did not offer him or her something to keep the customer. I am a Zoomerang customer who has been moved over to surveymonkey (due to the company buyout). I am really unhappy with surveymonkey. I find it slow and awkward to use. The reporting format is nowhere near as elegant as Zoomerang. Are there any ex Zoomerang users out there that have found anything similar to the old Zoomerang product?